Flicking these white plastic switches had no effect on the lights they’re supposed to control. Unscrewing the faceplate showed that a small piece of plastic that acted as a ‘catch’ for the switch was broken. I needed to replace the faceplate and switch mechanism. All the light switches in the Wendy House are the same style. Another one feels like it will break soon, frequently failing to work. I wanted to replace all of them with switches that have a firm action, are well made mechanically, are good looking, compliment the House style. I took my design brief to a local retail DIY store. The switches were displayed to show their faceplate, they were packaged in a way that prevented me seeing the mechanical action, materials and quality. Darn. I chose flat, reflective-nickel, switches. Black to compliment the old oak beams in my ceiling and wrought Iron door furniture. Black to make the switches easier to see against the light walls in the dark when I’m fumbling to turn them on. Unfortunately, the behind the scenes mechanism is deeper than the back-fittings of my old plastic switches. Replacing them was not just a process of swapping the plates and re-wiring. The masonry drill came out and the wall hole had to be made deeper. A bigger job than anticipated. Why aren’t switch box sizes a standard? Pah! 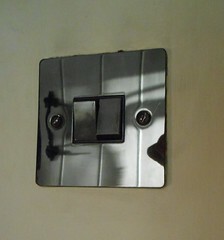 Now I’m loving my new sleek nickel switches, they have a very pleasing action with a good ‘thunk’ when they fall. This scribble was published on Tuesday, February 18th, 2014. You can follow any banter on this scribble with the RSS 2.0 feed. You can share your inspired musings after typing the anti spam word near the bottom of the page. But no Pinging because its too naughty. Those new switches look very slick and elegant, good choice! I seem to recall the backing boxes do have standard sizes … three of them, unfortunately. 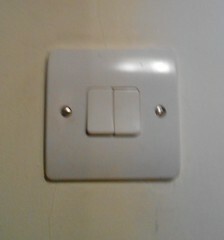 To be fair, I suppose some sockets and switches will need more space than others, and there’s not much point fitting the deepest ones for a light switch that only needs the shallow size: presumably that would have cost more and taken longer originally, to help in case years later you chose to replace with deeper switches.